NEW BATTING GLOVES FOR 2018! Super Light Weight Split Finger Glove, with high-density foam protection. Soft-Fill Cotton Lining - for superb comfort. Cougar Pittards Reinforced Leather Palm - for comfort, moisture management and durability. Polymesh Vents in palm and gusset - for improved air-flow. Classy Blizzard White with Jorvik orange colourway. Vikings were known for using a shield wall to protect themselves, let these gloves be your shield wall. Brand new for 2018, Viking Jorvik Batting Gloves are made using high traction Pittards "Cougar" world class leather and are a split finger design, offering superior comfort and flexibility. Developed for performance, these gloves will give you exceptional comfort and superb protection. 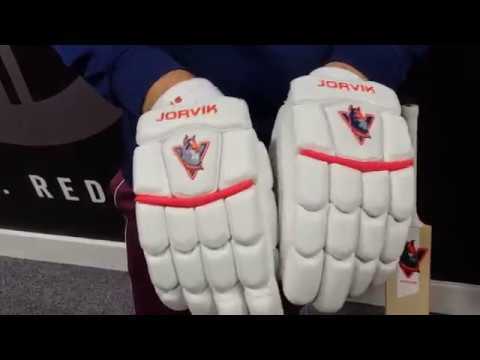 The Viking Jorvik Batting Gloves feel really light and are among the most comfortable gloves you will find. The high quality, embossed Viking decals and splashes of Jorvik orange complete the stylish look.